Within moments I was certain the film was observant and perceptive of what it is like to be a middle school wallflower, a type of friendless teen using social media apps as a surrogate for actual life. But my question was, is Eighth Grade going to be able to consistently say something vital for its entire running time? Because if it can’t, the film might just be another one-note dirge that’s too cringe-inducing to endure. 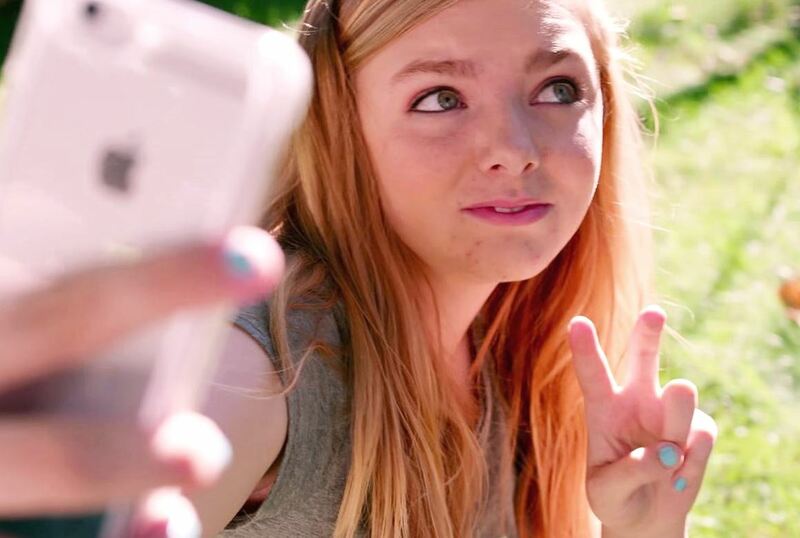 The rather incredible and resounding truth is that, while sad and even slightly torturous, “Eighth Grade” is highly worth the time. First-time director Bo Burnham is perhaps truthfully invested in empathy with his young protagonist, 13-year old Kayla (Elsie Fisher, who is fearless in playing unattractive and misguided). But there are moments where Burnham does objective compositions as illuminating as Gus Van Sant has with his most mesmerizing work – the kind of picture-making that makes us think about how the microcosm of school represents America at large. It is somewhere in America suburbia, and it’s a school like any other. Except there is something definitely “off” at this school, or at least something I sensed in relatively comparing it to the schools I went to in my time. Yet, the scintillating truth is, perhaps this school is like too many others. What “Eighth Grade” taps into – what other youth culture pictures have yet to depict at least to this insightful degree – are the essence of how schoolmates act like now in this digital age. The obsessions with Twitter, Instagram, YouTube and others are omnipresent everywhere, and your opinion cannot be validated unless it has that gone-through-social-media-filter-and-found-wide-acceptance-that-way type of mystique to it. Kayla has her own YouTube series, mostly centering around how to be confident in the world – a complete contrast to who she is in reality. Kayla foolishly attempts to project confidence with the wrong people. When Kayla talks to two mean girls, one of them a girl named Kennedy who she idolizes but doesn’t know why, the two mean girls use their cell phone use as a wall to ignore Kayla. It’s a disturbing moment, and you can’t help but hate Kennedy. Furthermore, you want to stop Kayla from trying herself to be yet another Kennedy. At home, love and communications and niceties are rejected by Kayla even when they are offered. Kayla has a dweebish dad (Josh Hamilton) whose attempts at connection are talking in ironic type of goofball voices to connect at a young and hip level, and we wonder for a long while, where is her mom? The mom is definitely absent. Kayla is always trying to put up a wall with Dad, because he’s the only person she can be mean to and get away with it. What’s real about the film, is it’s honesty on how a loner like Kayla spends her Friday nights: In her room, surfing the internet incessantly, listening to tunes with her earphones on. Everybody else’s Instagram or wicked multi-media post is a surrogate for the exciting life she doesn’t have. There are quite a few breathless moments when Kayla assimilates into some testy social situations, and you wonder, is she going to make a friend or meet somebody that breaks her? That enigma is what gets us holding our breath for the entire running time of “Eighth Grade.” Yet it’s surprising, too, on a higher level, with how much the film has to say about the twenty-first century. Film Cousins: “Welcome to the Dollhouse” (1996); “Mean Girls” (2004); “Disconnect” (2012); “Lady Bird” (2017).